Cloudera plans public cloud push as applications multiply in financial services, insurance, life sciences, retail and telecommunications. Hadoop may not be easy, but it is gaining mainstream adoption. Hadoop is going mainstream, it’s increasingly moving into the cloud, and it’s delivering solid business value. These are three key themes that were highlighted this week at Cloudera’s third annual Analyst Day in San Francisco. Financial Services: Cloudera has more than 100 customers in this category, and use cases typically start with governance and security. Big banks, for example, have to retain transactional data for regulatory reasons, and many have embraced Hadoop for high-scale data-retention and analyses including anti-money-laundering and stress testing. As the bread of data in a data lake spreads across lines of business, financial services develop 360-degree views of customer preferences and behaviors (customer 360). Insurance: Insurers use Hadoop for customer 360 and claims-fraud analysis applications. More mature adopters are moving into Internet of Things (IoT) applications such as usage-based pricing. In the automotive arena, for example, pay-as-you-drive and how-you-drive pricing will be ubiquitous within a few years, a Cloudera exec predicted. The platform is making high-scale analysis of telematics data practical and affordable. Life Sciences: Whether it’s healthcare providers, pharmaceutical companies or crop sciences firms, these organizations are modernizing their data infrastructures to handle data at unprecedented scale. Cloudera customer Cerner, which analyzes electronic medical records on a Hadoop-based platform, has come up with an automated way to predict sepsis infections in hospital patients. The alerts have reportedly saved more than 3,000 lives to date. Retail: It’s all about getting closer to the customer, differentiating products and services, and optimizing inventory to maximize sales and keep customers happy. That’s a journey that starts with resolving customer identities across channels and then better integrating data from across channels. These first two steps get you to the most valuable stage of understanding customer interactions, behaviors and value across all channels and over time. Telcos: Telcos are big users of Hadoop, and they start with governance-oriented call-data-record remediation and customer-churn analysis. Operations groups use the platform for network troubleshooting, security and risk analysis. As use of the platform matures, front-end and back-end insights are integrated for proactive network optimization, customer service and anti-churn initiatives. The four themes that cut across all industries are driving customer insights, improving products and services, reducing risk and modernizing IT infrastructures. On this last point, Cloudera said that only 15% of its 850-plus enterprise customers have deployed its software on public clouds, but that’s where it’s seeing the fastest growth. “Data that’s born in the cloud wants to stay in the cloud,” observed Cloudera Chief Strategy Officer, Mike Olson, and that trend will accelerate as IoT scenarios flourish, he said. Cloudera plans to ramp up in this areas with Cloudera Director, an automated cloud deployment tool and abstraction layer that hides the complexities and differences among various clouds and deployment options including Amazon Web Services, Google, OpenStack and VMWare. With Cloudera Director 2.0, released in January, Cloudera added a cluster cloning feature and the ability to automatically grow and shrink clusters to save money. 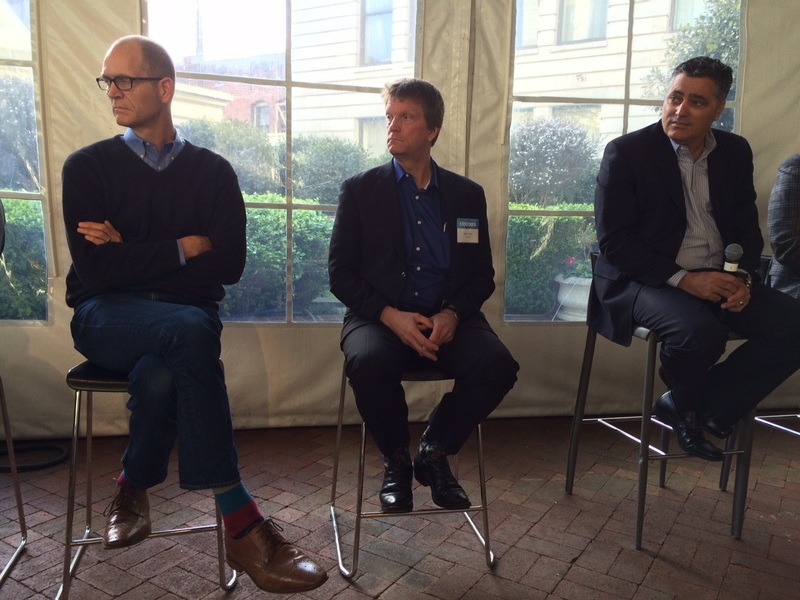 Cloudera executives (left to right) Doug Cutting, chief architect, Mike Olson, chief strategy officer, and Tom Reilly, CEO, at Cloudera Analyst Day, March 22, 2016. There was a bit of a disconnect between what Cloudera talked about in its market observations and strategy overviews and what it detailed in its product roadmap (which was largely under NDA). For example, there was no signal of new cloud deployment capabilities beyond Director 2.0, other than supporting Microsoft Azure as a deployment option. And despite all the talk of industry specific use cases, Cloudera executives only vaguely alluded to blueprints, templates, and frameworks — from Cloudera and from partners — that give customers a starting point on proven applications. It’s nice to hear about vertical use cases, but Cloudera has much more work to do on broad platform acceptance before it can go too far down the vertical-industry path. At one point during the day Cloudera described its technology as being “fast and easy.” When I questioned execs about the use of these terms, Chief Strategy Officer Mike Olson qualified that Hadoop is fast and easy as compared to relational database approaches when trying to solve high-scale data challenges. He also pointed to efforts Cloudera has made to simplify deployment with tools like Navigator Optimizer and Cloudera Director, which speed and ease analysis and optimization of SQL workloads and cloud deployment, respectively. At other points during the day Cloudera execs talked about the time and money the company has to invest to help clients move from proof-of-concept projects to broad and fruitful production use. And it also discussed how it’s now employing extensive automated testing to ensure the quality of its software distribution, which is now includes more than 25 open source components. In short, “fast” and “easy” are not terms I would associate with Hadoop deployment. But “proven,” “value driving” and even “industry standard” work for me and for the many companies that now rely on the platform.